Surf forecast looks good for the next few days. Call in and say you saw it on the blog and save 20%. Surf is up on Tybee. 10 second period with light winds. Grab your boat and get some. Hatteras in OBX has 18ft with an 11 sec period. 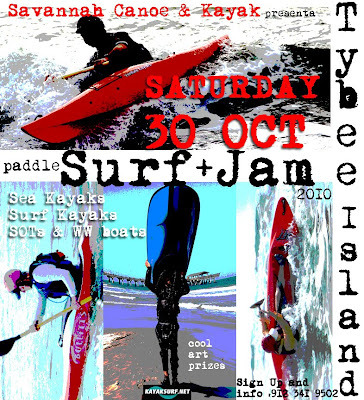 Registration is open for the Tybee Island Paddle Surf Jam. Novice: Participants who have competed in two or less competitions. 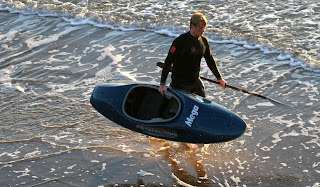 Sea Kayak: Any sea worthy sea kayak over 15 feet in length. 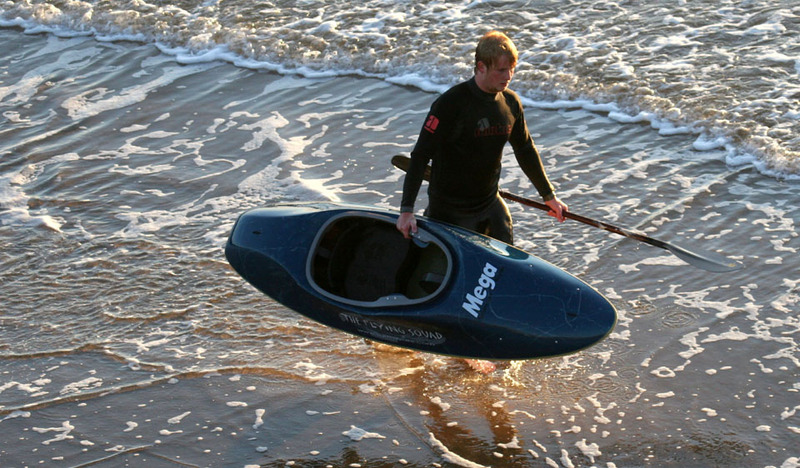 Open - Men: Any surfable sea worthy kayak or ski under 12 feet in length. Open - Women: Any surfable sea worthy kayak or ski under 12 feet in length. Great art prizes up for grabs as well as lunch on the beach. Double Sit on Top kayaks provided by Jim @ Feel Free. Hot off the drawing board from Professor Pearcey comes The Mega Proton.Following along in the lineage of the very successful Mega Boost,the Proton is as fast and hair raising, if not even a little more so. 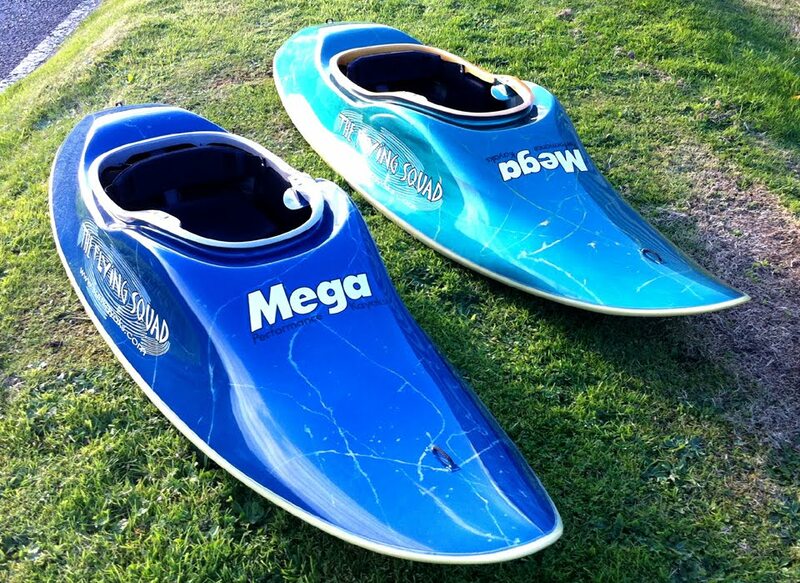 Designed for those unable to squeeze into it's smaller sidekick, or those looking for more stability and comfort, The Mega Proton is the now the vessel of choice for the larger paddle surfer. With some tweaking of the length to width aspect ration and a little more depth in the seat Mega have produced a larger, faster kayak. After all, it's those 'wave crushing' big guys that need that extra lift and speed. Mega Flying Squad members Chris Hobson and Glyn Brackenbury took the boat out for it's final test flight at the weekend and gave it a big, grinning thumbs up. Chris weighs in at 220lbs and Glyn is currently tipping the scales at 245. Color of boats shown is a mix of metallic silver and oxford blue with silver splats. More specs, reviews and pics coming soon. Mega Proton coming soon. All Mega models currently in stock at Savannah Canoe & Kayak. Call 912 341 9502 for more info. Special events are planned at National Wildlife Refuges across the country to celebrate NATIONAL WILDLIFE REFUGE WEEK, October 10-16, 2010. 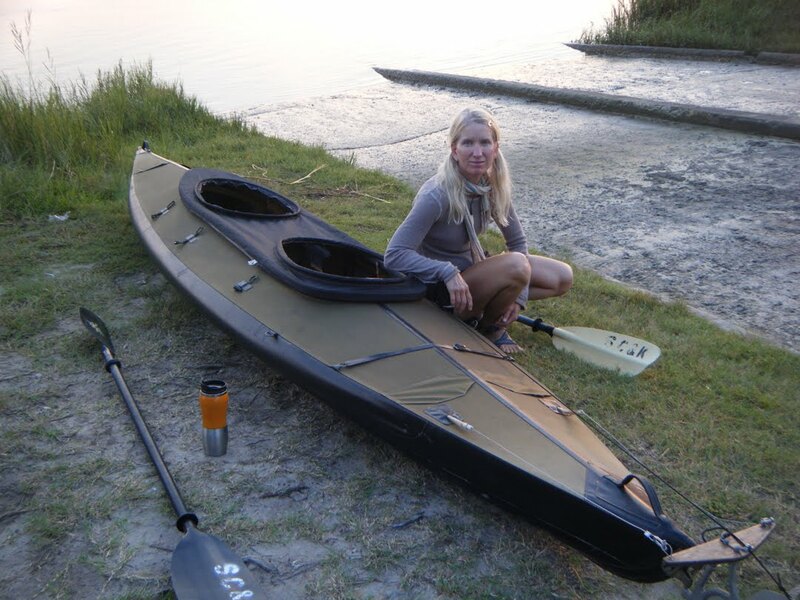 Locally, the Savannah Coastal Refuges Complex, managed by the U. S. Fish and Wildlife Service, will sponsor interpretive programs combined with kayak paddles, bicycling tours, and hayrides. The Savannah Coastal Refuges network includes seven National Wildlife Refuges (NWR), which extends from Pinckney Island NWR near Hilton Head, South Carolina, to Wolf Island NWR near Darien, Georgia. Between these lie Savannah (the largest), Wassaw, Tybee (the smallest), Harris Neck, and Blackbeard Island refuges. Together these federal lands, managed by the U. S. Fish and Wildlife Service, span a 100-mile coastline and total nearly 57,000 acres. On Pinckney Island National Wildlife Refuge (NWR), from Saturday, October 9 through Sunday, October 24, Refuge Week activities will include hayrides (1.5 hr trips, offered daily at 3:30 PM and 5:30 PM); bicycling tours (two hours, beginning at 10:00 AM daily); and combination hayride/kayak paddles (three hours, beginning daily at 8:30 AM and 12:00 PM).Call 843/686-3554 or email waterdogoutfitter@yahoo.com for reservations. At Harris Neck NWR, hayride tours will be offered on Saturday, October 16, from 10:00–11:30 AM and from 2:00-3:30 PM. Fish and Wildlife Service (FWS) staff and volunteers will serve as guides, providing information on the refuge’s history, wildlife, and management activities. Highlighting these tours will be interpretive presentations by Richard Kanaski, the FWS’ Southeast Regional Archeologist. Also planned at Harris Neck NWR on Saturday, October 16 will be a special family program, “Meet Your Reptile Neighbors,” featuring an array of live snakes and turtles. FWS volunteer herpetologist, Dave Chafin will share his knowledge of Georgia reptiles, and help dispel ignorant beliefs such as “the only good snake is a dead snake!” This free reptile show is scheduled for 1:00-2:00 PM in the tent next to the refuge office. President Theodore Roosevelt established the first National Wildlife Refuge in 1903, Pelican Island in Florida, to protect herons, egrets, and other colonial nesting birds from slaughter by market hunters. He established 50 more refuges during his presidency, nearly all to protect species threatened with extinction, such as the buffalo. Today, that legacy has grown to 552 refuges, 37 wetland management districts covering 150 million acres in all 50 states and several territories. 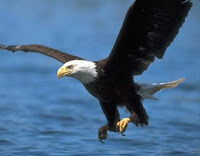 Find your local wildlife refuge here.. Closing date for entries into the National Surf Kayak Championships is October 4th. 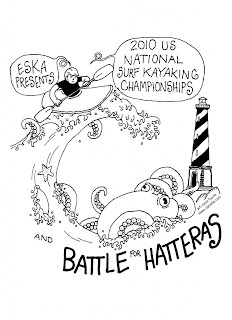 We hope to have 4 paddlers from Savannah taking part in this event at Cape Hatteras N.C. Turn out is expected to better than normal for this ESKA competition, which have seen dwindling numbers over the past 5 years. This event will also act as the trial run for the World Championships taking place at the same venue next Fall. 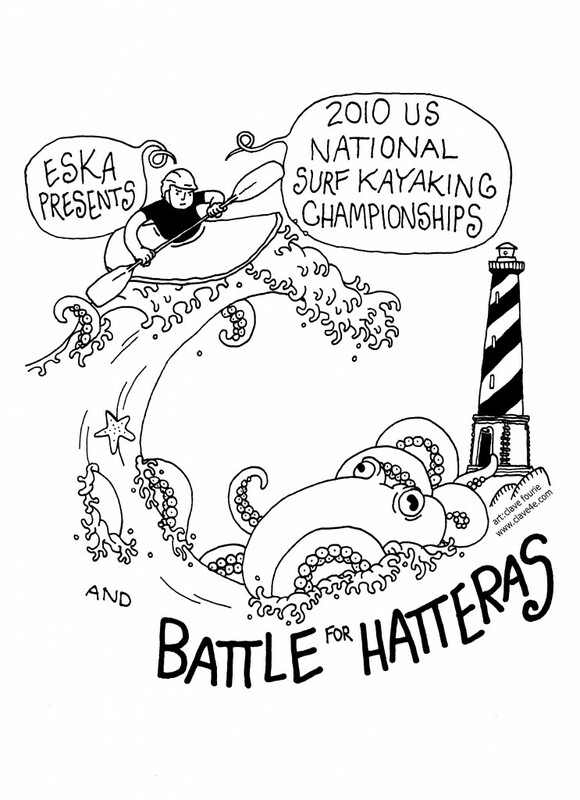 SC&K will be there lending their support to East coast and U.S paddle surfing and we wish Joey Hall all the best with the organization of this important competition. The SC&K instructional staff will be down in Florida this weekend teaching surfing classes. 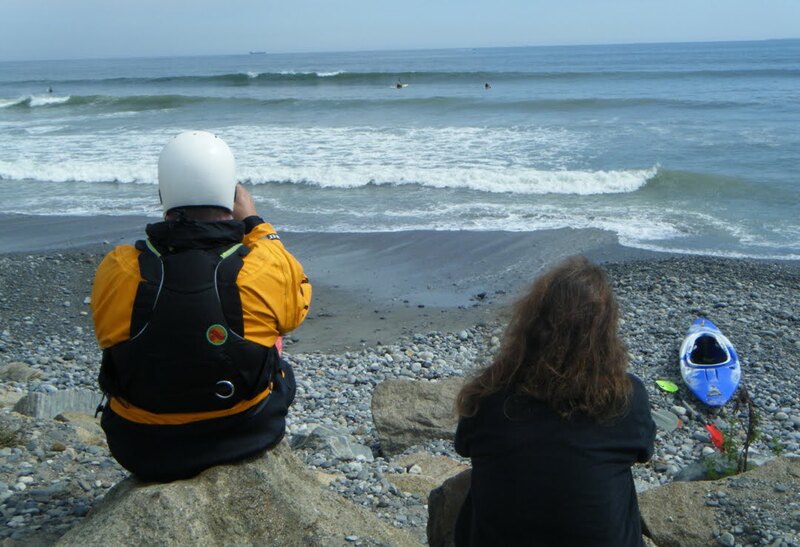 Two workshops spread over two days will focus on skills and comfort in the surf zone. In Sea and Surf Kayaks, the curriculum will include predicting waves, wave assisted and shallow water rolling, swimmer rescues, deep water rescues and better boat control through better body awareness....in other words better paddling technique combined with a little bit of observation and awareness. Surf is expected to be decent for the purpose at hand. Onshore winds up to 15knts. Surf Kayaks on Saturday. Sea Kayaks on Sunday. If you do not already have a reservation please do not come. Mega and Tiderace Demos available. Some great boat cam footage, Yuri ! Ben Lawry and Nigel Law teamed up once again to dish out there own brand of surf kayak instruction up on the New Hampshire coast this weekend. The timing could not have been better as Hurricane Igor swirled around mid Atlantic and the multiple rocky headlands of the NH coast gave pristine point breaks at every bend. Surf increased over the weekend and culminated in outstanding conditions for Sunday.... A solid 4ft with a 15 second period gave the surf campers some head high set's on glassy seas. 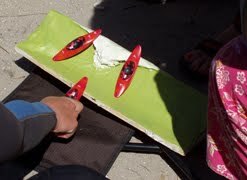 Everyone got to test their boats, skills and metal on what was a perfect Surfday. "It's a lot like Old England, but better value." 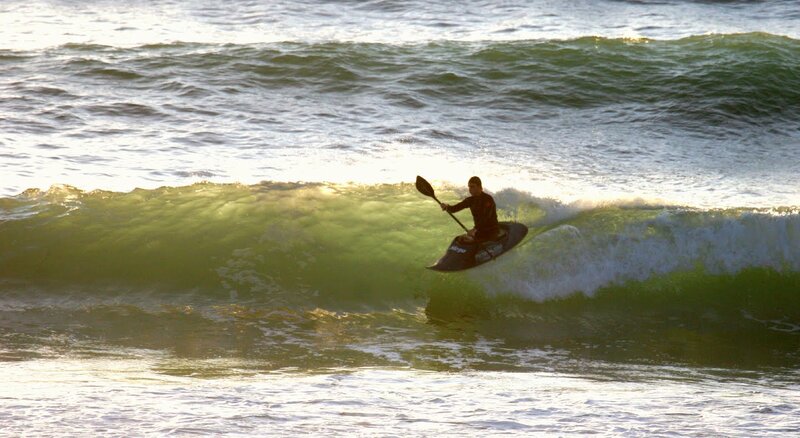 Skill level was across the board with paddlers in SoT's, WW boats and surf kayaks. We will be putting some video clips of the event together soon. Tonight.. Monday, Sept 20, at the JEA on Abercorn St. in Savannah. Thirty years ago the bald eagle was on the fast path to extinction. This year the Georgia Department of Natural Resources documented 135 occupied nesting territories and 187 young fledged. Jim Ozier, Program Manager for Georgia DNR, leads this survey effort and will discuss both the Georgia nesting eagle population and the aerial and terrestrial survey techniques used to monitor them. The program, free and open to all, will be held at 7:00 pm on the 2nd floor of the Savannah Jewish Education Alliance building, 5111 Abercorn Street, Savannah. 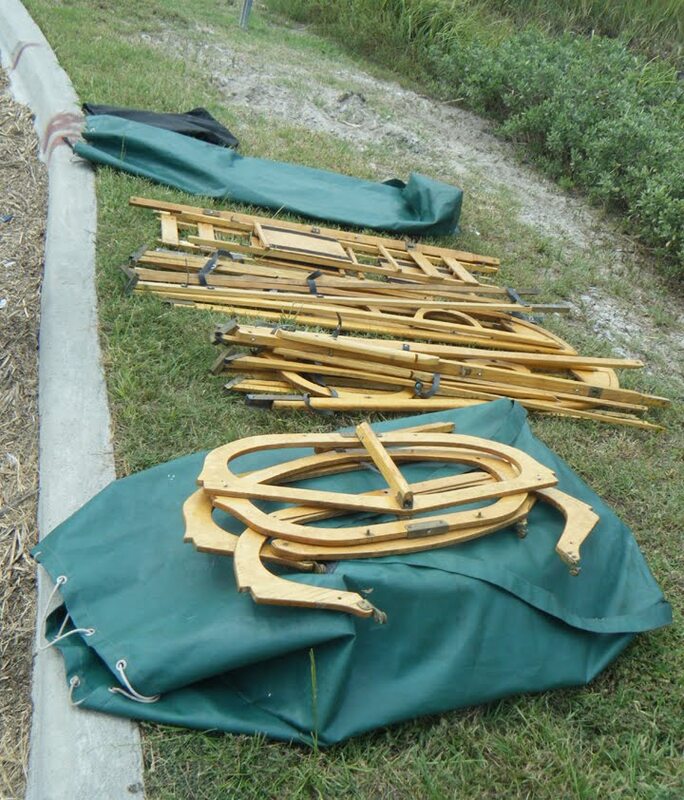 For further information call Beth Roth at (912)658-6136. For only the second time in recorded history there are now two category 4 storms in the Atlantic. Both storms are expected to reduce in intensity, but 25ft seas ahead of Igor should start a good ground swell rolling to shore later today. By the weekend, swell period (diagram on left) should be 14-16 seconds,with light onshore winds, giving us good, shoulder high sets. According to Captain Pat, Monday looks like the best day with winds turning off shore, cleaner conditions and Joes back at work. Looks like Nigel will miss all the action as he is gone to NH to teach, wait for it, a surf class ! Oh brother! What a Joe! 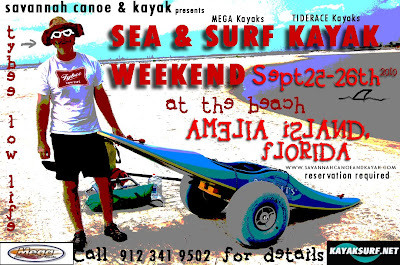 Oh well, surf should stick around for the following weeks surf camp in Amelia, FL. 1926 was the last time we had two such big storms swirling in the ocean. With the winding down of the 'Hi' season, our thoughts turn to the 'Off' season and how best to make use of this time period. As our friends and customers know, during the winter we run a 'reduced to none' service depending on enthusiasm, weather, and finances. This year, however, due to the departure of key team member Mr. Joey, we will be implementing our continually expanding bucket list of paddling adventures. 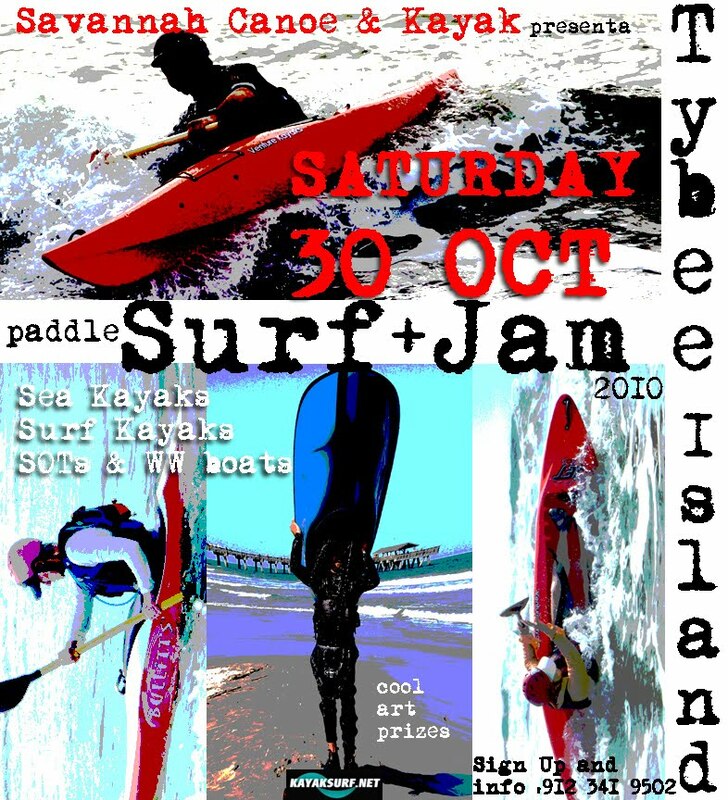 The list, amassed after ten years of paddling to Little Tybee everyday, will be kicked off this winter. It was 10 years ago that we paddled down the Mississippi and into the Gulf to the Florida Keys. At the time we thought it was a good idea. Now, 10 years later we think it was a brilliant idea. 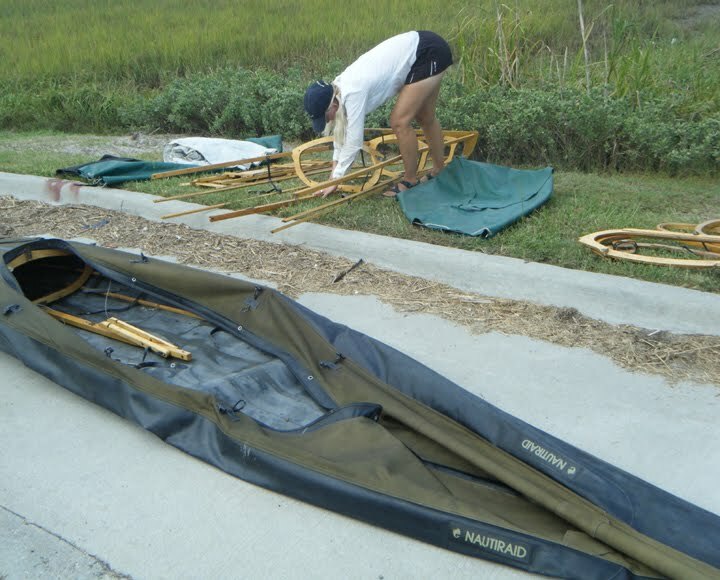 For many of the planned trips we will be using a folding kayak....a 2 man Expedition Nautiraid. Neither a canoe or a kayak, and able to fit in the trunk of a taxi, we think the Naughty Raider the perfect vessel for several of the trips listed below.. especially since many of them are one way river trips. We will be writing about these adventures and posting photos on this blog. These adventures serve no other purpose than to satiate our desire to paddle the roads less traveled, to expose ourselves to other ideas and cultures, and to meet people we would otherwise not meet on the GA Coast. Our only sponsorship will come from each other. The gear we use will be of little consequence, unless of course, it fails. reaches of the Savannah River. 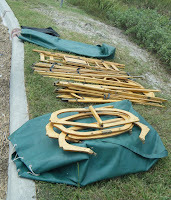 The very well constructed kayak performed quite well, was very comfortable, and disassembled in under 15 minutes. Assembly time is expected to drop down to about the same. The next test paddle will be with a full load on the Savannah River. We will take the bus to Augusta and paddle back to Savannah. Trip down the River Thames, England. Probably Richmond to Greenwich. Circumnavigation of Brownsea Island, England. Circumnavigation of Manhattan Island, USA. Night Trip Up the Girond Estuary to Bordeaux, France. Trip down the Ganges River, India. Probably mid section Kanpur to Varanasi. Trip along the Jurassic Coast, England. Trip on the Inside Passage, Vancouver Island section, Canada. Trip along the Maine Kayak Trail, USA. Trip down the River Kwai, Thailand. Trip down the Green River, Utah, USA. Day trip on Loch Ness, Scotland. Plus a whole bunch of others that we will make up as we go. 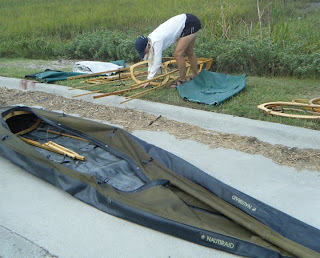 In order to facilitate this new section of SC&K we have had to cancel this years GA Coast Expedition. We will, however be scheduling a 9 Day Complete length of the Georgia Coast trip for November 2011. Last Thursday evening was the last open Roll and Rescue session of the year. After not attending this event for most of the season, it was great to see how much everybody's rolls had improved. It had become more rolling and less rescue for sure. Sunday morning sea kayak surf sessions will continue into the Fall. The Coastal Regional Commission is preparing an official guide for a saltwater paddling trail that traverses the entire coast of Georgia. 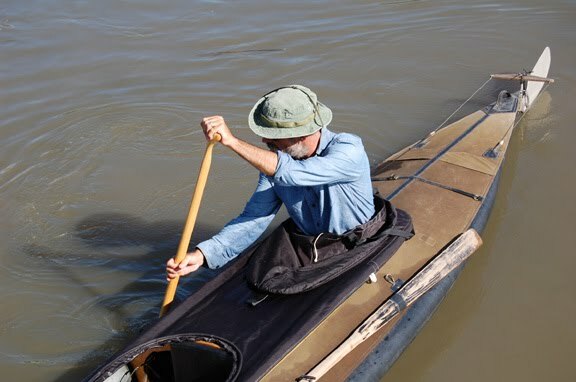 This guide will provide a resource for paddlers to navigate the Georgia coast safely. Two meetings will be held to inform the public of the intent of the Coastal Georgia Blueway Plan and to receive comments on the proposed draft action plan. The first meeting will be held on Thursday, September 2, 2010 from 6:00-8:00 p.m. at the John W. Stevens Wetlands Education Center located in the rear of the J.F. Gregory Park in Richmond Hill, Georgia. The second meeting will be held on Tuesday, September 7, 2010 from 6:00-8:00 p.m. at the Coastal Regional Commission office located at 127 F Street in Brunswick, Georgia. Please consider attending one of these meetings so that your suggestions may be taken into consideration for the final plan.